Live life to the fullest in this beautiful 3-bed, 3-bath vacation rental cabin in LaFollette. 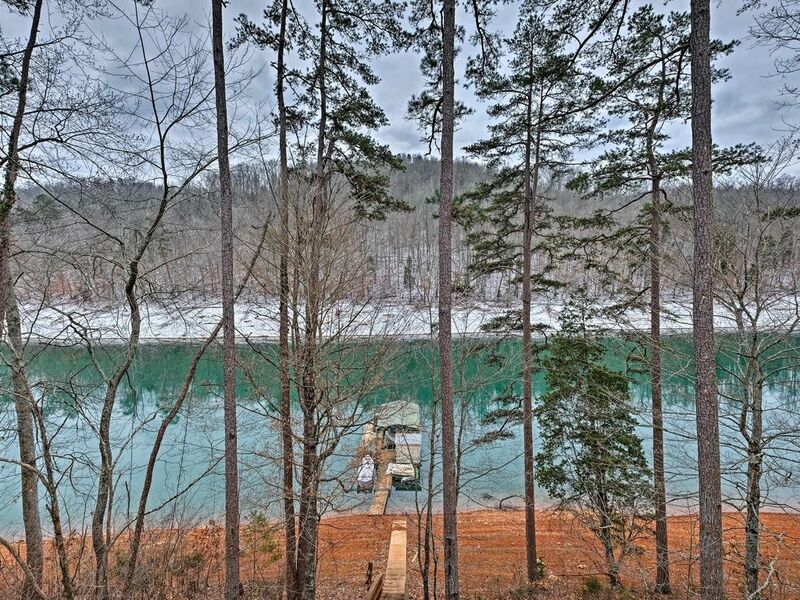 Nestled in a quiet cove on Norris Lake, this 1,300-square-foot home for up to 13 boasts breathtaking lake views, a private dock, and copious amounts of outdoor seating, making it the perfect place to soak up the southern sun. Whether you plan to spend your Volunteer State getaway hiking or lounging in front of the flat-screen Smart TV, you're sure to have an unforgettable time in this lakeside cabin. Spend a Tennessee afternoon exploring Norris Lake’s 34,000 acres of crystal clear water, located just steps from the cabin. With a private dock featuring a water slide, boat parking, and a pedal boat, guests can carve up the glass-like water, splash with the little ones, or simply sunbathe in the rays! The outdoor fun won't end when the sun goes down thanks to the backyard's endless amenities. Whether you choose to gather around the firepit, whip up burgers on the stainless steel gas grill, or share stories on the covered porch, this property is sure to provide family fun day after day. Need a break from the elements? Head into the living room and melt into the plush couch. You’ll stay cool during your trip with a split-system air conditioning unit allowing independently controlled temperatures in 5 zones throughout the home. As you watch the Vols game on the 50-inch flat-screen Smart TV with satellite, try not to be distracted by the delicious aromas emanating from the fully equipped kitchen that has everything you’ll need to cook tasty meals at home. Enjoy your meals at the screened-in porch's table for 8. Before bed, let the kids enjoy fun time in the play closet or head down to the lower-level bedroom and have a family movie night on the 32-inch flat-screen Smart TV. As they drift to sleep in their bunk beds, turn off the TV and retire to the loft. The loft comes complete with exposed beam cathedral ceilings, a king bed, and a birds-eye view of tree tops and the lake. Looking to have a memorable day on the lake? Take your boat out on Norris Lake or stop by Shanghai Marina and rent pontoon boats, ski boats, jet skis, and more. Anglers will be eager to drop a line in the water for a chance to land a bass, crappie, or walleye. Looking to learn about the history of the area? Head 20 minutes down the road to Cove Lake State Park and spend an afternoon exploring the park’s 667 acres. Cove Lake State Park is home to the remnants of the ancient Mound Builders that once called this area home. When you want to eat like a local be sure to check out one of LaFollette's many delicious eateries that sit just 15 minutes away. Whether you decide to feast on pizza at Charley’s Pizza Parlor or you chow down on prime rib high above the clouds at McCloud Mountain Restaurant, you're sure to return to the cabin full and happy! - Amenities include a fully equipped kitchen, screened-in porch, private dock with seating for 4, boat parking on dock, pedal boat, stainless steel gas grill, fire pit with seating for 12, 50-inch flat-screen Smart TV with Satellite, 32-inch flat-screen TV with a DVD player, seating for 8 on covered porch, seating for 12 on upper deck, free WiFi, washer, dryer, driveway parking for up to 6 vehicles, and more! - Unbeatable LaFollette Location - Steps from Norris Lake, minutes from the Cumberland Trail, 20 minutes to Cove Lake State Park, 15 minutes from local eateries, and 8 miles from Deerfield Cove Marina! We had a great time, and a great experience. The cabin is stocked with all your essentials, the view is fantastic, and the hot tub was the perfect ending to each day. Great location, fully equipped kitchen! Great place, fully equipped kitchen, and great location on the lake! Will definitely stay in this place again! You cannot go wrong here! Absolutely LOVED our stay and didn't want to leave! This property is close to Sugar Hollow Marina if you need to rent a boat. Their pontoon boats are nice. You are also close to Shanghai Marina, which has good food (approx. 7 min boat ride), and the Tiki Club, which has good drinks (approx. 15 min boat ride). The cabin was clean and well equipped. Do not rent if you don't like stairs. There are stairs to the dock, but that didn't both us at all. Water is beautiful and clean! We plan to rent again this property again. Nice size cabin that was clean. Perfect location on the lake. Great cabin for the family! We loved this cabin and all of its amenities. Will definitely stay here again! We had 6 adults, 5 kids and 2 boats and fit in the cabin just fine. I have never stayed in a cabin that was better equipped. It was like being at home, everything you needed was already there. The location on the lake was fantastic, close to the jumping bridge and on a very quiet cove. The marina next to it wasn't great, but Shanghai Resort (4 miles by boat) was very nice. Loses one star for their trash policy- you have to take it all with you. Packing up a weeks worth of leaking, smelly garbage in the car to haul it to the dump 15 minutes away left a bad taste on the way out from an otherwise great trip. I would stay there again though.